Hi everyone, I have recently stitched my freebie pattern, it was a real quick stitch, I changed the colours slightly from the original pattern to match this fabric, I had this in my stash which I am probably going to use to make it into a teabag holder to pop inside my handbag, I have already made a teabag holder out of this fabric and I really liked it, some of you may have seen this exchange before, but just in case you didn't I have posted the pictures below. 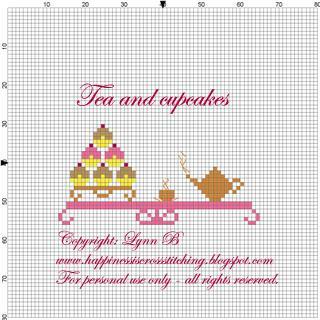 You can get the free cross stitch pattern for my tea and cupcakes design here. 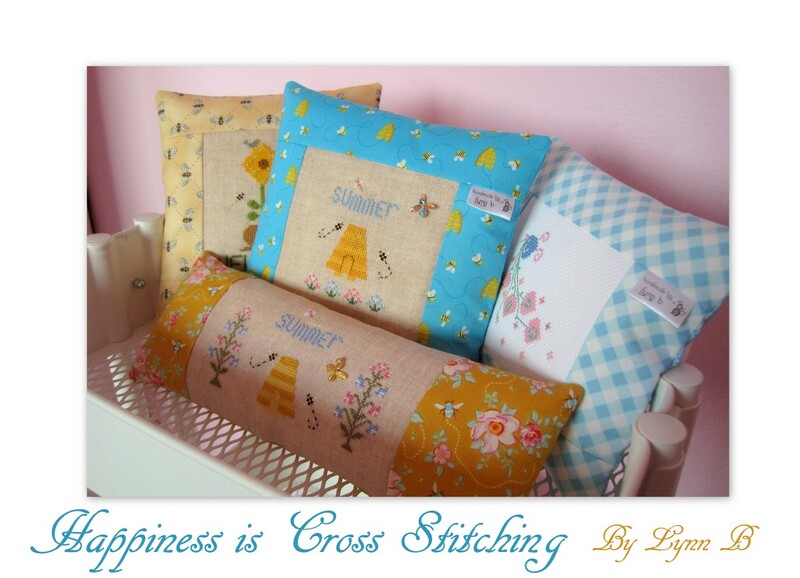 I have a new dressmaking blog! Hi everyone, I am pleased to announce I have a new dressmaking blog, if you would like to see the first dress I have made in 20 years just click here and it will take you to my new blog which I have named Lynns Dressmaking. I am really pleased with the results, I think the dress looks lovely, (I hope you do too) the skirt hangs beautifully and I have bought a little navy blue shrug which matches the dress perfectly, although there is a matching bolero jacket on the pattern I have not yet found the right fabric for this. I was a little nervous picking up my scissors and patterns again but I need not have worried, once I got started it was like I had never been away! I will still be doing my cross stitching but if you are missing me here you can always check out my dressmaking blog to see what I have been up to! I have currently made some progress on Little House Neighbourhood, I am also going to start another small project from a Little House Needlework pattern this weekend., not sure which one yet. Tea and cupcakes freebie pattern. Hi everyone, I have been neglecting my cross stitching this week in favour of dressmaking, I am currently making a dress after not dressmaking for twenty years, however, I am pleased to say I still remember how to put a pattern together! Just so that you know I am still here I have decided to finish off this little cross stitch design I started a number of weeks ago and offer it to my blogging friends as a freebie, just click on the picture and print it off. Usually I like to stitch a model of the design so that you can see what it looks like stitched and finished but I was too busy doing other things. I do hope you like it, I would love to see this pattern stitched up by someone, if anyone does manage to stitch this I would love to see photo's. Angel stitching arrived at it's destination! 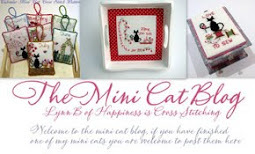 Hi everyone, a couple of weeks ago I offered to do some Angel stitching for the Stitch Red exchange at the Hooked On Exchanging blog here and Lisa over at Lisa's Cross Stitch Paradise blog here was the recipient. I used the alphabet from freebie pattern that I have in my stash, unfortunately I cannot remember where I got it from, I think it was a DMC freebie, however if you would like a copy just leave a comment with your email address and I will gladly send it to anyone who asks. Please make sure your comments allow replies as some don't and I have no way of contacting the people who do not have a blog. For the small pillow pattern I copied part of a large pattern from the swapppons blog, you can see the link in the previous post for this. 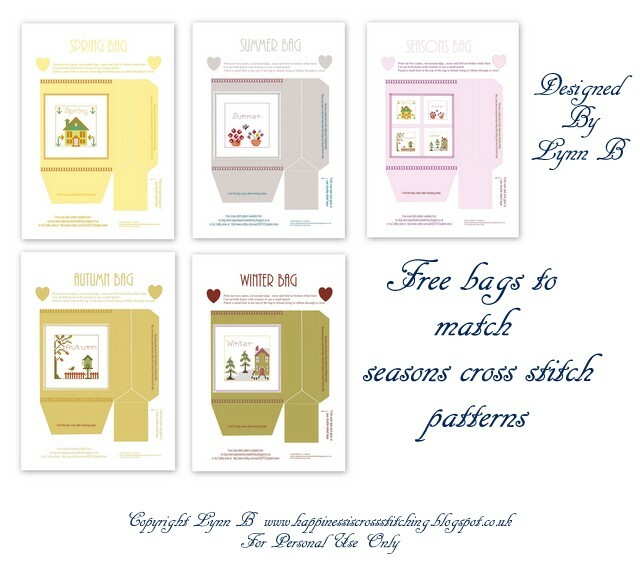 I also made Lisa some labels for Lisa's cross stitch projects, you can see the tutorial for these here on my tutorials blog. I read Lisa's blog and noticed she liked butterflies so I decided to make the little butterfly pins with a couple of mill hill beads to finish off. All you need for the decorative pins are a couple of ordinary pins, mill hill seed beads, glue (I used gem tack glue but you can use fabric glue as I know it works) and a charm with a hole through the middle. Just pop a tiny bit of glue at the top of the pin, slide a mill bead on to the pin, followed by a little more glue a charm and then another bead, press them together, leave to dry and your done! It was called Stitch Red for the Heart so I chose this fabric for the reverse of the pin keep. Here are the labels made in a selection of colours. I trimmed the top of the pinkeep with a couple of swarovski crystals. I am pleased to say that Lisa let me know that she loved what I made for her! I do enjoy stitching these alpahabet letters, they are so quick to stitch and rather effective don't you think? I have also been stitching on my Little House Neighbourhood this week but not enough to show much progress. Many years ago I used to make all of my own clothes and I am pleased to say I have now got the sewing bug again. After looking in the shops and not being able to find any summer dresses that I really liked (unless they were very expensive) I decided to buy some patterns and some fabric to make some myself, I am really pleased with the fabric, it is rather pretty and I can't wait to get started - I may even start a sewing blog so watch this space! Must go, husband is wanting me to make some scones today, my sister has also put an order in so I am going to make a double recipe and take them over as a surprise!!!!! Hope she does not see this post before I can get to her home, if you do Ann-Marie get the kettle on! Hi everyone, I have finally finished this box and I am quite pleased with the result, inside there are a little collection of accessories of which you can see in the photo's below. I have also heard from Lisa that she has received my Angel stitching for the Hooked on Exchange Blog, I will show that in my next post but here is the gift all wrapped up. Lisa said she loved the wrapping and could not wait to see what was inside! I must say, I usually like to make a special effort with the wrapping because I think it makes it more exciting for the recipient. A note for Angela who left a message asking about the alphabet pattern. Angela, you requested the alphabet pattern, however I could not reply to your email because it was set as 'no reply', you also don't appear to have a blog, if you send me your email address I will gladly send you the alphabet pattern, it is a freebie! I finished the box in silk dupion and stitched the cross stitch in DMC 964. If you would like the pattern it is a freebie here from the Swappons blog, I have shown the cross stitch piece before but not fully finished until now. 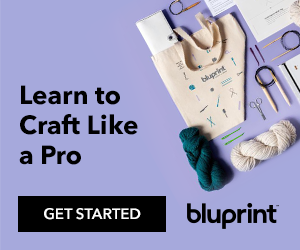 If you scroll down to the bottom on the swappons page you can click on the red Adobe PDF link on the right hand side and gain access to the freebie pattern. I decided to stitch the accessories using small sections of the pattern and then designed and stitched the silk strawberry trimmed with mill hill beads and pink spider web roses. I am hoping to draw the pattern for the strawberry and upload to my blog for everyone to have access to it...... not sure when though, hopefully sometime soon. Here are the other photo's of the box and contents, I do hope you like them! You can see my tutorial showing how to make a box on my tutorials blog here, it is not exactly the same inside but I have just added a couple of separating panels to the box below. I trimmed the box with my favourite swarovski crystals. I added this little embroidered padded section to the inside lid to hold my needles or pins. Embroidered strawberry - my own design. I made the butterfly pins after making them for another gift recently, I liked them so much I made some for myself! Here is the pinkeep trimmed around the edge with swarovski crystals of course! I am currently working on my Little House Neighbourhood, hopefully I can show you some progress on my next post. Welcome to all of my new followers and thankyou for all of your lovely comments!